Inspired by #France‘s #YellowVest movement, thousands in #Taiwan turn out for third protest demanding #TaxReform. 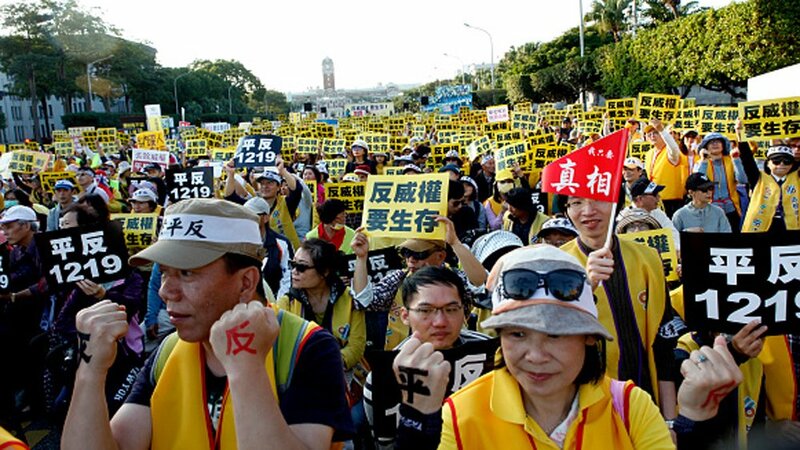 Thousands of Taiwanese protesters, taking a page from France‘s yellow vest movement, marched on Thursday for the third time this month, demanding lower taxes and the fair handling of tax disputes.Wearing yellow vests, the demonstrators shouted slogans and blared air horns outside the Ministry of Finance in the island’s capital Taipei, and waved banners calling Taiwan’s tax collection policies illegal. The “yellow vest” anti-government protests that have rocked France to enter seventh Saturday for reasons of tax reforms, social security and is being by protesters accuse Macron of favoring the rich with his policies. Macron sought to defuse the crisis in mid-December by announcing a 10 billion euro ($11.4 billion) package of measures to help pensioners and low-paid workers. The “yellow vest” anti-government protests that have rocked France will be held on Saturday and New Year’s Eve, and continue into 2019, several sources in the movement said on Thursday. “The yellow vests are still mobilized,” said Laetitia Dewalle, one spokeswoman of the protest movement which does not have a traditional leadership structure. Several of the movement’s representatives said a seventh straight Saturday of protests will take place across the country this weekend. Yellow-vest representative Benjamin Cauchy said protesters would be out on New Year’s Eve as well, “to show that the mobilization will not end in the new year”. Cauchy also warned that if the concessions made so far by President Emmanuel Macron did not add up, “we will end up with a large-scale mobilization in late January”. Paris city officials said that New Year’s Eve celebrations on the Champs-Elysees will go ahead despite the protest plans on the famed avenue. Tens of thousands of tourists and locals traditionally ring in the new year on the wide shopping boulevard, which ends with the Arc de Triomphe monument. The Champs-Elysees has since last month been the epicenter of repeated violent protests against Macron’s government, with the Arc de Triomphe ransacked on December 1. While the numbers turning out at protests across the country have dwindled dramatically, several thousand people are listed on Facebook as planning to attend what it calls a “festive and nonviolent event” on New Year’s Eve. Paris officials said they would continue as planned with preparations for a fireworks display and sound and light show on the Champs-Elysees under the theme “fraternity”. But on recent Saturdays it has been the scene of violent clashes between riot police and “yellow vest” protesters who accuse Macron of favoring the rich with his policies. The movement sprang up online in October and spiraled into the worst crisis of Macron’s presidency, with tens of thousands blocking roads and protesting across France. Since then the “yellow vests” have been split between moderates willing to engage in dialogue with the government and others intent on remaining at the barricades. Priscillia Ludosky, who launched an online petition against rising fuel taxes in May that is credited with a major role in sparking the movement, said the measures announced by Macron were “insufficient and without any real desire to improve the living standard of the French”.